Animal testing is unethical, inhumane and completely unnecessary. With so many alternatives available to us, how can we justify the poisoning, burning, shocking and killing of more than 100 million animals each year causing them unimaginable pain, fear and loneliness? Thousands of animals suffer and die every day in laboratories around the world, but it doesn’t have to be that way. If we truly want to improve our lives and the lives of others, we need to cut out the use of animals altogether. Animals are not little humans, and although we might share most of our genes with other mammals, our physiology and the way our genes actually function is critically different. Animals don’t suffer from human diseases and the longer we waste trying to recreate these illnesses in animals, rather than studying their human form, the less chance we will have of understanding and curing them. The distress that laboratory animals are forced to endure has been proven to cause unpredictable changes in neurochemistry, genetic expression and nerve regeneration, leading to unreliable and ineffective results. 9 out of 10 drugs that appear promising in animal studies go on to fail in human clinical trials because it is not possible to accurately predict how they will behave in people. 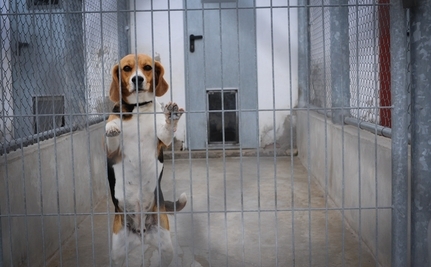 Relying on animal experimentation in some cases impedes and delays discovery of drugs and precedures that may be beneficial to humans because they fail in animal testing. Organs-on-a-Chip – Instead of conducting toxicity tests, drug tests and disease research on live animals, Harvard’s Wyass Institute has devised an effective organ-on-a-chip process in which human cells are used to create mini organ simulations. Human Brain Imaging – Advances in brain scanning and imaging techniques mean that it’s now possible to conduct a wealth of usable data and statistics which is far more useful than the questionable data collected from cutting into the brains of monkeys, cats and rats. Human Blood Testing – Instead of killing hundreds of thousands of rabbits each year in “pyrogen” tests, scientists can now test for fever-causing contaminants in medicines by using human blood samples. Microdosing ­– When test patients are given a microdose of a drug which is well within safe limits, advanced imaging techniques can be used to detect the way the body breaks down the substances. Many people believe that animals are here for humans to use, and even if we have to sacrifice 100,000 animals in the hope of benefiting one person, then it is worth it. But the truth is that ethical human-based tests will better help our loved ones and save millions of animals annually. Vivisectors and pro animal testing advocates are running out of excuses. There is a better, more kind way. Show your support by choosing only to buy cruelty free products. And are YOU going to volunteer???? Hello Aaron, -Latest research from the University of Eastern Finland finds that eating a healthy diet of fruit , vegetables and fish between the age of 40 to 50 , slashes the risk of Alzheimer's disease by 90 per cent. Foods to avoid are butter , cheese , sugar , eggs , fast foods , and other sources of SATURATED ANIMAL FAT . Meat is a major source of these fats. Journal of AMA -" The correct balance of GOOD ( HDL) and BAD ( LDL) cholesterol levels in the blood is essential - get the balance wrong and harmful protein deposits called beta amyloid plaques can build up in the brain. I will not get into PRIONS from meat and blood !!!!!!!! I think we are in basic agreement bot not totally. There is much that is being withheld . It is not the high LDL cholesterol that is bad for you, but whatever you did to cause the high LDL cholesterol. "Cholesterol is natures repair substance, used to repair wounds, including tears and irritations in the arteries." Of course you will have high cholesterol counts if your body is damaged by your poor diet. Watch Dr. Mercola's cartoon on youtube about "skid marks". This is a satire of the stupidity of allopathic medicine and their use of such drugs like "statins" to treat people. David, then quit focusing on the "who", and focus on what makes more sense. There are many books on this subject. Cholesterol was originally blamed by association/correlation; but there has been no scientific study that has validated the hypothesis that cholesterol was the cause of the conditions it has been correlated with. We all know that correlation does not equal causation. Cholesterol is produced in almost every cell in your body. Levels of HDL/LDL cholesterol is merely a marker. If your body is high in LDL, this is correlated with bad outcomes. That doesn't mean LDL is bad for you. It merely mean that your body produces more of it when the condition of your body is in a horrible state. Obviously, by this reasoning, statins are completely stupid. Like many drugs, they are treating the symptom of your condition, rather than the cause. How long did it take doctors to realize that suppressing a fever is one of your body's mechanisms for fighting illness? and that a fever should only be suppressed if it gets dangerously high? Same reasoning applies here. By using the statins, you are just suppressing your own body's healing mechanisms. Aaron, its hard to know who to believe any more. Your comments go completely in the face of what I have read. I am a sceptic about statins and their so called benefits. What is your opinion ? @DAVID s. Regarding aspartame. I've done extensive research on this subject, and it is the methanol (aka. wood alcohol) component of this substance that causes neurological damage. Wood alcohol is quite deadly to humans at very small amounts, but is perfectly harmless to other animals. Aspartame breaks down into methanol in your body. The aspartame lobby tries to convince the public that methanol is harmless. The argument they use to back this claim is that it is present in natural foods. This is misinformation, because anywhere methanol is found in natural fruits and vegetables, there is ethanol in equal concentration. Ethanol blocks the adverse effects of methanol in the human body. In fact, ethanol is used in hospitals to treat methanol poisoning. Only in fruits or vegetables that have been canned, does the methanol concentration grow beyond that of the ethanol, and it is suspect that this is indeed harmful to humans for the same reason that aspartame is. @David s. "MYTH: Cholesterol & saturated fat clog arteries. TRUTH: There is very little cholesterol or saturated fat in the arterial plaque or clogs. Most of the material is a calcium deposit akin to lime and most of the fatty acids are unsaturated." "Cholesterol, especially LDL-cholesterol (the so-called bad cholesterol), helps fight infection." Yes Aaron, bread is high GI and has high salt content; fried potatoes have denatured fat and beverages full of sugar, preservatives and artificial colouring like tartrazine. I believe there are many concerns over aspartine also in diet drinks. Burgers full of saturated fats also, especially if they have come from factory farms where the animal is kept alive on antibiotics. This is leading to us building up resistance to antibiotics, which are rapidly not working, as is shown in hospitals by the increasing number of antibiotic resistant illnesses like mrsa.